Your rental payments in the palm of your hand. Make payments, track payments, view your rental history, and set-up reminders. Use any Australian bank account or credit card to pay your rent any time. It's super secure and we won't ask for any banking passwords. Use your rental payment history to show what a great tenant you are next time you apply for a rental. What if my Agent or Landlord is not set up for RentPay? You can use RentPay regardless of whether your agent is set up. Just go to the RentPay app and follow the setup process. Contact us if you have any problems getting started and we'll walk you through the process. All personal and payment information is stored in a secure database that is housed in a high security data-centre. These premises are highly secure banking environments, so you can be assured that your personal information is protected and safe. RentPay is compliant with the Payment Card Industry (PCI) standard as further assurance your details are safe and secure. We undergo an annual audit to ensure our security practices remain best practice. 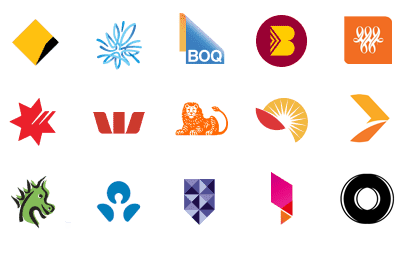 What are the fees associated with paying via my bank account, BPAY, or AustPost? RentPay has a monthly membership fee of $3.00 charged in the 1st week of each month via direct debit. Note, this fee does not apply if you choose to pay only by credit card. In addition to the monthly membership fee, a fee of $0.88 per transaction is applicable for payment made via BPay, and a fee of $1.92 applies to transactions via Australia Post. Other fees may apply if a scheduled payment is dishonoured due to insufficient funds. Please refer to the RentPay terms and conditions for more information. What are the fees associated with paying by credit card? Paying by credit card incurs a surcharge of 1.25% for Visa/Mastercard and 2.5% for American Express. This surcharge is billed on top of the rent payment. For example, a payment of $500.00 from a Visa card will be charged at $506.25. No membership fee applies if you choose to pay only by credit card. For more information see the RentPay terms and conditions. Do I get charged the monthly fee if paying by credit card? No monthly fee will be charged provided no Bank Account/BPay/Australia Post payments have been made in the month, and at least one payment has been made by credit card. Log into your online banking and choose BPAY as the payment method. Enter the BPAY Biller code, customer reference number (CRN) and amount and make the payment. These details can be accessed from the payment methods menu item in the payment settings menu in the app. How do I pay at Australia Post? The easiest way to pay with Post Billpay is to visit one of the 3,200 Post Offices and make a payment over the counter using the barcode provided. This can be accessed from the payment methods menu item in the payment settings menu in the app. Why would a payment be missed? Sometimes when we attempt to withdraw the funds, the bank may decline the payment. Generally, this is a result of insufficient funds, however it can be caused by an expired credit card or closed account. Can I make a RentPay payment over the phone? Yes. So long as you are registered for RentPay call 1300 668 668 to make the payment. Is it better to pay by credit card? If you choose to pay using your credit card this means that your payment will be received by your agent faster, as credit card payments take 2 days instead of 3 days to clear. Will I earn reward points if I pay by credit card? If your credit card is already linked to a frequent flyer rewards scheme, or store rewards scheme, then your rental payments will be included in your total credit card spend, and therefore earn the corresponding points. When does my agent receive my rent? Direct debit payments take 3 business days to process. So if you make a payment on Monday, the agent will have the funds in their account on Thursday. Credit card payments are faster. They take 2 business days to process. A credit card payment made on Monday will be in the Agent's account on Wednesday. Why can't I schedule the payment on the date the rent is due? In order for your payment to be received by your agent on the due date, it is important to schedule your payment as least 3 days before the due date for direct debit from your bank account, or 2 days if by credit card. If I need to change the payment type for one of my payments can I do this? Yes. You can make a one-off payment through RentPay using a different payment method, however if you are using autopay it is important to stop this, make your payment, and then set up autopay again ready for the next due payment. RentPay fees are deducted via direct debit from your nominated bank account on the first business day of each month. The amount will be made up of your membership fee plus any additional transaction costs that may apply to you. Please note this could take up to 3 days to process. Do I have to use the rent.com.au app to pay with RentPay? 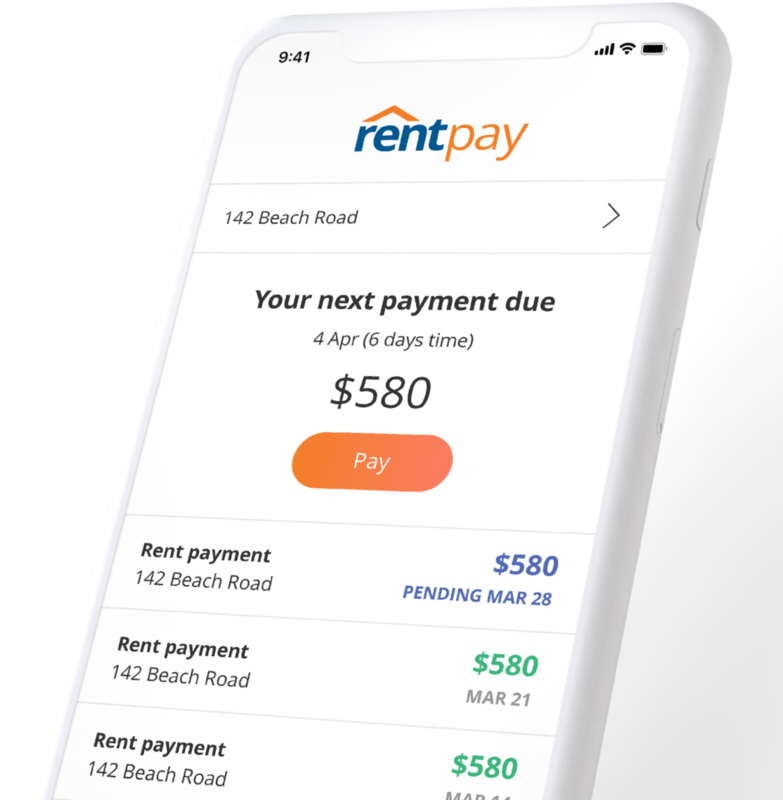 Whilst you don't have to use the rent.com.au app to pay your rent with RentPay, there are advantages in using the app, including quicker access to your payment details, and access to your rental payment history. Can I access my rental payment history with RentPay? Yes. RentPay keeps a record of every payment made including the date and amount. This is accessed from your RentPay portal. 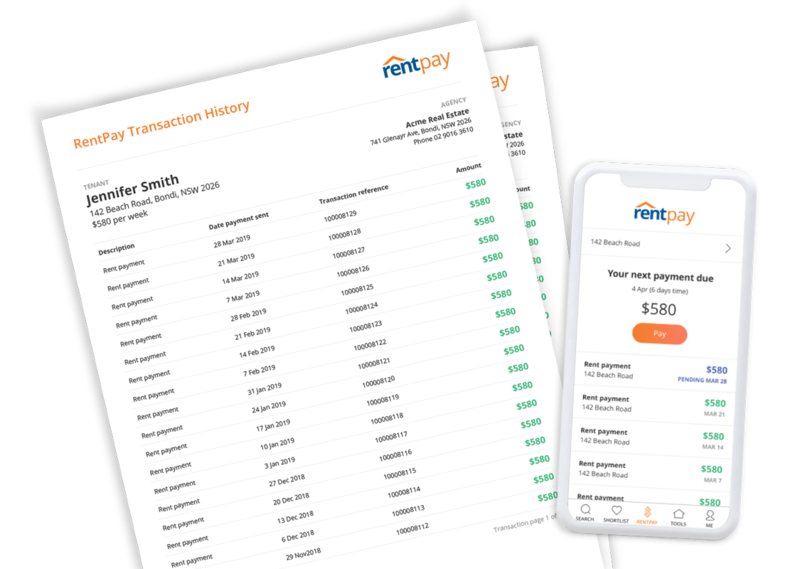 If you are using RentPay in the rent.com.au app, you can even print out a convenient rental payment's history report. This is handy to show agents when you are applying for a new rental to show your good payment history. Can I pay my water bill with RentPay? Yes. If your property manager has sent you the water bill charge, you can pay this one-off payment through RentPay, however it will show as Rent Payment in the RentPay system. What does 'payment pending' mean? Payment pending indicates that your payment has been lodged for transfer to your agent however your bank hasn't cleared the payment yet. You can email a customer service representative at support@rentpay.com.au or contact us directly by calling 1300 797 933. We're open from 9am to 7pm AEST Monday-Friday. I can't login to the RentPay. You can change your password at any time. Just login to the tenant section of the RentPay website, go to "settings" and select "Change Password" and follow the simple instructions. Note that if you are using RentPay in the Rent.com.au app, that password is your rent.com.au password. What do I need to do if my payment is dishonoured? My agent says they didn't receive my rent, what do I do? First check your bank account or credit card online to see if the payment has cleared. You can then email a customer service representative at support@rentpay.com.au or contact us directly by calling 1300 797 933. We're open from 9am to 7pm AEST Mon-Frid. I don't want to pay by Direct Debit or Credit Card.